Dr. Canzoneri and his team in Arcadia are always on the lookout for new dental technologies that we can add to the office to make your experience here more pleasant and more comfortable. Our latest find is the 3Shape TRIOS® intraoral scanner. In the past, taking an impression meant filling trays with impression material and having the patient relax until the material was set. For some patients, these few minutes can prove to be almost unbearable, especially those who have a sensitive gag reflex. With the 3Shape TRIOS® intraoral scanner, digital impressions in Arcadia are fast and easy. 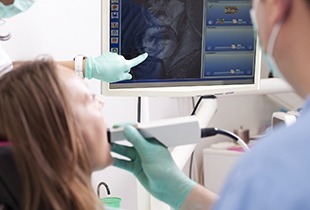 Dr. Canzoneri or an assistant simply inserts the camera-loaded wand into your mouth and a 3D picture quickly develops on a computer monitor that is located chairside. A combination of some 1,000 3D images is used to create a clear image of your tooth and the surrounding tissue. There’s nothing else that goes in your mouth—no spray, no impression material. The 3Shape TRIOS® intraoral scanner makes scanning any tooth fast, easy, and comfortable for you, the patient. Additionally, because the image created is immediately displayed on the computer monitor next to your chair, Dr. Canzoneri can discuss treatment with you and explain his recommendations with the help of the 3D image. 3Shape TRIOS® intraoral scanner captures such accurate digital impressions, the restorations Dr. Canzoneri is able to provide are far better fitting than those that were based on impressions from molds. 3Shape TRIOS® intraoral scanner also makes monitoring lesions, staining, decay and other oral health concerns easier.